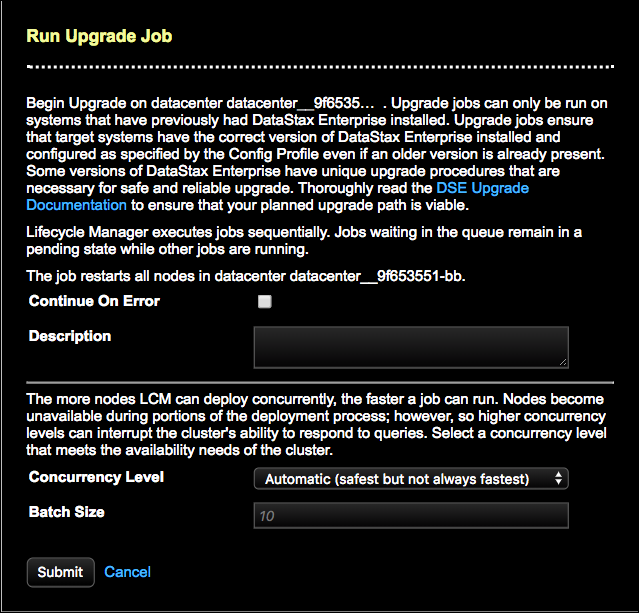 After cloning a configuration profile with an updated DSE minor version, run an upgrade job on a datacenter or node. The upgrade job downloads and installs DSE and applies the values in the associated configuration profile. Submit a DataStax Enterprise install job to run on a cluster, datacenter, or node in Lifecycle Manager. Run a configuration job that pushes DSE configuration profile updates at the cluster, datacenter, or node level in Lifecycle Manager. End-to-end example of upgrading DSE from version 5.1.0 to 5.1.3 using Lifecycle Manager. Abort a pending, running, or an idle job in Lifecycle Manager. Adjust the default timeout values for Lifecycle Manager jobs as necessary for your environment. 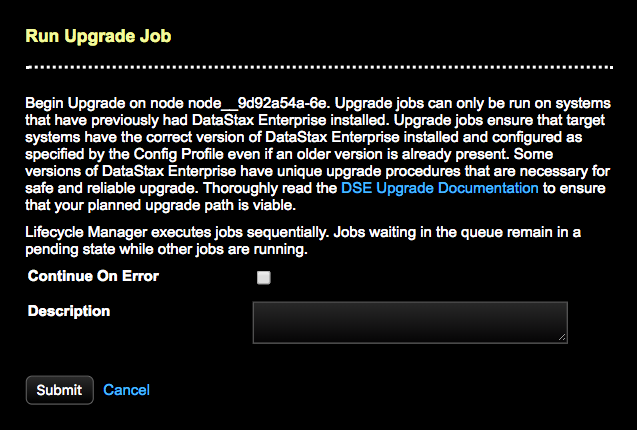 After reviewing the DataStax Enterprise (DSE) patch release upgrade documentation and cloning a configuration profile with an updated DSE minor version, run an upgrade job on a datacenter or node. The upgrade job downloads and installs DSE and applies the values in the associated, cloned configuration profile. LCM install and configure jobs fail if the installed DSE version does not match the version specified in the configuration profile associated with a cluster, datacenter, or node. Clusters using different versions of DSE do not inherit configuration profiles. Automated DSE upgrades to minor versions within a release series are supported in Lifecycle Manager for versions 6.5 and later. Automated DSE upgrades to major versions. Note: Upgrades at the cluster level are not allowed because there are frequently context-specific requirements about the order in which datacenters must be upgraded, and steps that must be performed to prepare a datacenter for upgrade or recovery afterward. Review the DSE upgrade guide documentation. Also, review the upgrade documentation for the applicable DSE patch release to determine which patch version to upgrade to. DataStax strongly recommends upgrading to the latest patch version. Important: Upgrade jobs fail if the operating system is not supported by the DSE version. Clone the configuration profile and select an updated DSE version. Click Clusters in the Lifecycle Manager navigation menu. Select the datacenter or node to run an upgrade on. Click the ellipsis icon and select Edit, then choose the Config Profile to use for the upgrade. The selected configuration profile will be associated with the datacenter or node being upgraded. 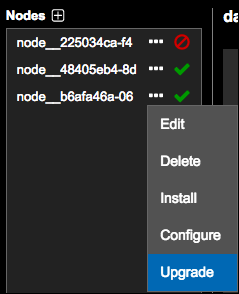 Click the ellipsis icon and select Upgrade for the datacenter or node being upgraded. The Run Upgrade Job dialog displays. Tip: Click the following thumbnail images to view the expanded dialog. To override the default error behavior and continue running the job on subsequent nodes until all nodes are finished, select Continue On Error. The job continues running despite encountering errors. By default, a job ceases running on additional nodes upon encountering an error on any given node. Any nodes that are already running continue to completion. Optional: Enter a Description about the upgrade job. For example: upgrade node from DSE 5.0.7 to 5.0.9. The description displays in the Jobs pages when Viewing job details. Make additional selections depending on whether you are upgrading a node or a datacenter. If running an upgrade job for a node, skip to step 9. If running an upgrade job for a datacenter, continue with the following selections. Note: Concurrency Level is not applicable to node-level jobs. Automatic (safest but not always fastest): Default. Allows LCM to determine a safe concurrency level to use. Use this option when unsure which other option would be appropriate. Note: The Automatic option executes one job at a time, both for nodes in datacenters that were previously installed by LCM, and for nodes in new datacenters where an install job has not yet successfully completed. This behavior mirrors the Single node option. Single node: Executes job on one node at a time. Use this option when having more than one node offline at a given time would impact availability. One node per DC: Executes job concurrently on at most one node per datacenter (DC). Use this option if having a single node in each DC offline does not impact availability. Single rack within a DC (might interrupt service): Executes job concurrently on nodes such that at most one rack has nodes down at a time. Use this option if having an entire rack within a DC offline does not impact availability. One rack per DC (might interrupt service): Executes job concurrently on nodes such that at most one rack in each DC has nodes down at a time. Use this option if having an entire rack in each DC offline does not impact availability. All nodes within a DC (interrupts service): Executes job concurrently on all nodes in a DC. Use this option if having all nodes in a DC offline is acceptable. All nodes (interrupts service): Executes a job concurrently on all nodes in a cluster. Use this option if having all nodes in a cluster offline is acceptable. Enter a Batch Size if the default (10) is not appropriate for your environment or selected Concurrency Level. The selected Concurrency Level makes many nodes eligible to run concurrently (such as the All nodes within a DC option). The default Batch Size results in job run times that are too long. Your environment can handle a larger number of nodes performing downloads and installs simultaneously without impacting network bandwidth or the LCM server. Note: Batch size takes effect only when a large number of nodes are eligible for concurrent deployment, such as with the All nodes concurrency policy. Batch size has no effect on jobs with the Single node concurrency policy or on node-level jobs. Click Submit to submit the job. A dialog indicates that the job is in the queue to run. Click View Job Summary to navigate to the Jobs page to monitor the job progress. Click Close if you do not want to immediately monitor the job and prefer to remain in the Clusters workspace.